Hamburg, March 20th, 2019: YXLON International, a division of the Swiss Comet Group, is launching a brand-new range of X-ray inspection systems dedicated to the Semicon industry. These systems offer advanced automated 2D and 3D inspection of bumps and filled vias to locate, identify and measure failures, including non-wetted bumps, voiding and misalignments to the highest standard. In terms of resolution these systems are among the best on the worldwide market. 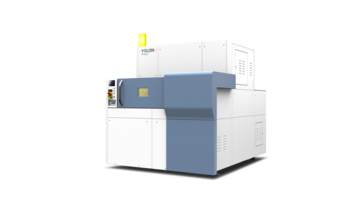 The range is being introduced during the Semicon China exhibition in Shanghai, March 20-22, 2019, booth #2439 – with a live presentation of the YXLON FF70 CL. YXLON International, a company of the Swiss Comet Group since 2007, designs and produces radioscopic and CT inspection systems for the widest variety of applications and fields. Whether situated in the aviation & aerospace, automotive or electronics industry, our customers are among the largest producers, major enterprises that place their confidence in our quality worldwide. With our headquarters in Hamburg, sales and service locations in Yokohama, Hudson (Ohio), San Jose (California), Beijing, Shanghai, Hattingen and Heilbronn, as well as a network of representatives in over 50 countries, as YXLON we’re local for our customers all over the world. Based in Flamatt, Switzerland, the Comet Group has a presence in all world markets. We employ more than 1,400 people worldwide, including over 500 in Switzerland. Besides production facilities in China, Denmark, Germany, Switzerland and the USA, we maintain various subsidiaries in the USA, China, Japan and Korea. Comet (COTN) is listed on the SIX Swiss Exchange. For more information, visit https://www.comet-group.com/home.